PagerDuty is an incident management and alerting system. PagerDuty collects alerts from various monitoring systems, and notifies the appropriate team members based on your on-call duty schedule and escalation policies. AlertSite can send alerts directly to PagerDuty to automatically trigger and resolve incidents. In AlertSite – Admin, Co-Admin, or Power User. In PagerDuty – Account Owner, Admin, or User. Private locations (Private Node Server and InSite) support PagerDuty alerts starting from version 2.0. In your PagerDuty account, go to Configuration > Services. Enter the Name for the service (for example, AlertSite UXM) and select the needed Escalation Policy. Under Integration Type, select AlertSite UXM from the list of tools. Type AlertSite into the filter box to find it faster. Scroll down and click Add Service. 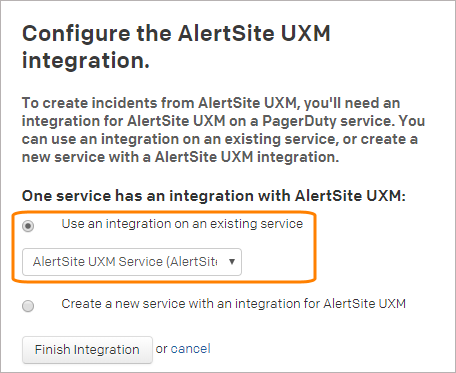 In AlertSite UXM, select Alerts > Alert Recipients from the top menu. Select PagerDuty from the Method list. You will be redirected to the PagerDuty website. 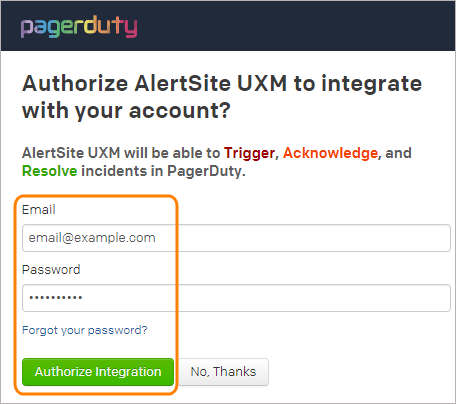 Enter your PagerDuty email and password, and click Authorize Integration. Select Use an existing AlertSite UXM service, then select the service that you created earlier. To select the alert types to send to PagerDuty, click next to the recipient and specify the settings for availability and performance alerts. For a description of available settings, see Recipient Properties. Note: By default, all AlertSite monitors send alerts to all configured alert recipients. But if you have recipient groups configured, each group’s monitors send alerts only to recipients in that group. In this case you need to add the PagerDuty recipient to the relevant groups to receive alerts from monitors in that group. In AlertSite, configure a monitor to trigger an alert. For example, edit the monitor settings and set the timeout to 1 second, or create a keyword validation for a word that does not appear in the monitored web page. Wait until the next time the monitor runs. It will trigger an alert. In PagerDuty, open the Dashboard. Click the incident number # to open the incident details. The problem description is in the status_text field in the Details table. For a description of other fields, see Alert Data Fields. Will PagerDuty incidents automatically resolve when AlertSite sends a “clear” notification? Can I integrate AlertSite with more than one PagerDuty service? Yes. 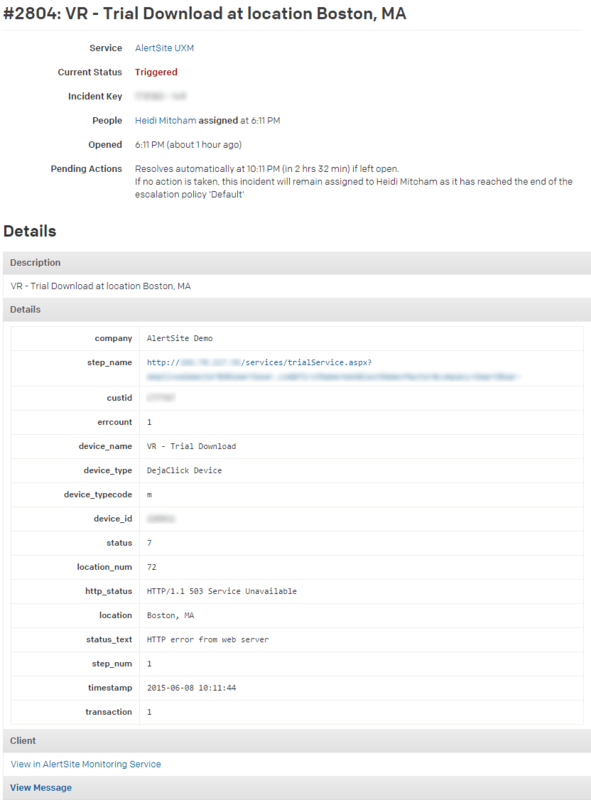 This way you can use different PagerDuty escalation policies for different AlertSite monitors. 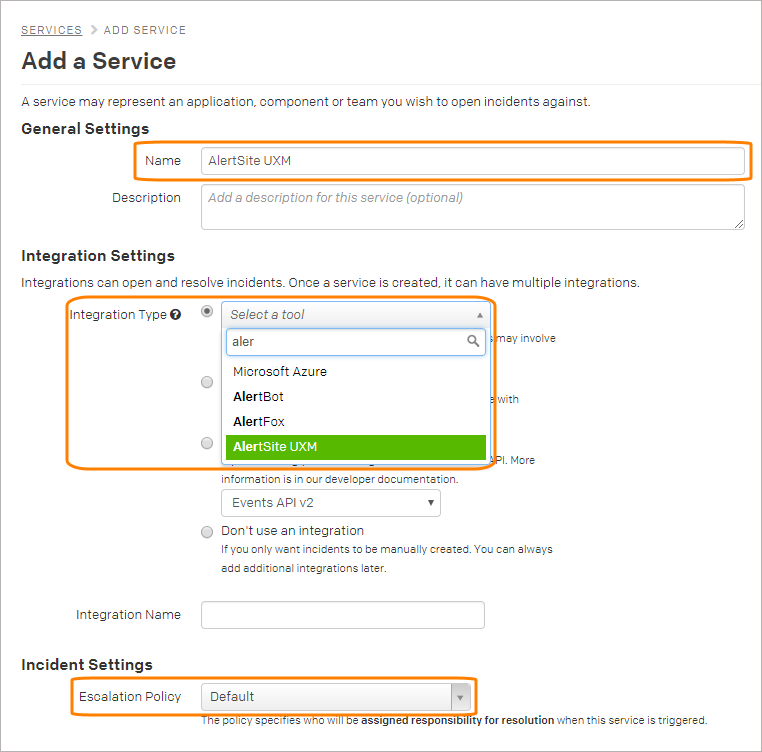 You need to create several AlertSite services with different names in PagerDuty, and the corresponding PagerDuty recipients in AlertSite. Contact SmartBear Support for assistance.